I received product from Food & Wine for Gorham for review purposes. As always all opinions are my own. Happy Halloween week! Halloween is my favorite time of the year. I was in the festive mood this weekend and decided to make Chicken Tikka Masala Jack-o-Lantern stuffed peppers! You can make this by using Indian leftovers or make your own at home version like I did. I got the idea to make my peppers into jack-o-lanterns from my friend Leslie a few years ago when she used hers as a bowl for tapenade. 1. Combine 8 tablespoons of Tikka marinade and 6 tablespoons of yogurt. Dice your chicken into bite sized pieces then marinate in half of the mixture for a few hours, reserving the other half for later. 2: Preheat your oven to 400. Cook the chicken for 25 minutes. 4. Carve a your peppers into a Jack-o-Lanterns with a sharp paring knife. You can have fun with this - make triangle eyes and noses, pointy teeth for the smile, or even a ghost face. Slice off the tops of the peppers, scoop out the seeds and cores. 6. Combine chicken, rice and additional marinade. Stuff the peppers with the mixture and place them into the prepared baking dish so they lean against each other. I paired this fun and festive meal with a bottle Columbia Crest Grand Estates Limited Release Gold Red Wine. This blend of Syrah and Cabernet pairs great with vegetables and only 7,500 cases were released. 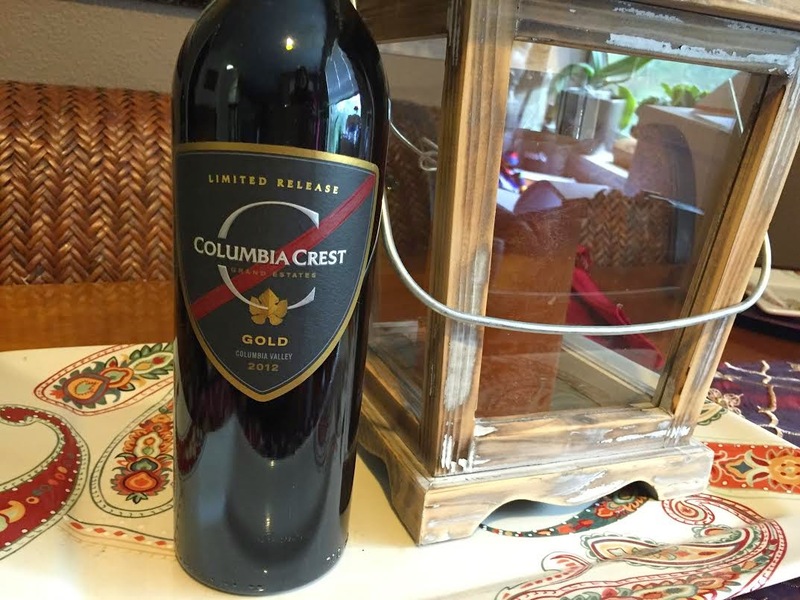 Columbia Crest Grand Estates has several new releases available nationally for a suggested retail price of $12 per bottle. Click here for more information. I know you are eyeballing my plates....we had guests over this weekend and before I could show them off, we received 2 compliments. I was ecstatic to hear the news that the Editors of Food & Wine created a collection for GORHAM (exclusive to Amazon). The editors of Food & Wine have used thousands of dinnerware and cookware over the years. They knew what it took to create eye catching, comfortable and satisfying pieces for everyday use. They took this knowledge and created a gorgeous collection. While we had our main wedding registry going towards our honeymoon, we also had a standard registry at Amazon. If this collection was around when it was time to register, we would have put quite a few Food & Wine created a collection for GORHAM pieces on our registry. When I received the Food & Wine For Gorham Modern Farmhouse 16-Piece Dusk Dinnerware Set I was beyond impressed. What I love most about the set is that they stack, saving room in the cabinets. Gabe wanted to mention that his favorite aspect is that they have a lip - which is amazing for eating dinner while watching TV! The Modern Farmhouse collection is rustic in design but offers sophisticated colors. Dishwasher-safe, microwave-safe and oven-safe. I also received the Food & Wine For Gorham Ellery 20-Piece Flatware Set . This set is very nice - they are made from durable 18/10 stainless steel, has a modern mirror finish, and are dishwasher safe and tarnish resistant. The, Ellery collection has a classic shape with a narrow, slightly rounded handle. Check out the entire collection of Food and Wine for Gorham . Next month, I will be giving away a set of the Farmhouse 16-Piece Dusk Dinnerware. In the meantime, there is a Dream Getaway sweepstakes , where you can have the chance to win a trip to Solage Calistoga Resort in Napa Valley worth $25,000! Click here for more info. The peppers are so cute & I love those plates! !